To say that root canal therapy has a bad reputation would be an understatement. Pretty much any unpleasant experience has been compared to a root canal! However, this procedure is actually one of the best tools we have to stop severe dental pain and save badly damaged teeth from being extracted. If you’re dealing with a terrible toothache, a root canal may be exactly what you need to finally get some relief. If you’re like most of our Assonet and Freetown dental patients, your only regret will be not getting it sooner! Why Choose Woodside Dental Care for Root Canal Therapy? Your teeth are actually composed of different layers, and the innermost one is called the dental pulp. If the pulp becomes exposed to bacteria, either due to decay or an accident that has cracked the enamel, it can easily become infected. This usually causes a very painful toothache because the pulp is also where the delicate nerve of a tooth is located. In order to stop this kind of pain and save a tooth from extraction, we’ll recommend a root canal. The procedure itself is actually not painful—the infection it is intended to treat is why root canals are thought of so poorly. After thoroughly numbing your tooth, Dr. Cornetta will access the pulp, remove any diseased tissue, clean and sanitize the tooth, and then he’ll rebuild it with a crown. 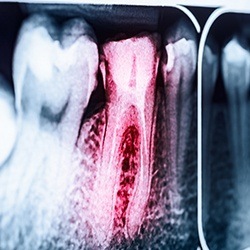 Thanks to modern-day dental techniques, most patients report feeling little to no discomfort during or after the procedure, and root canal treated teeth can easily look and function normally for decades afterward.